Natural beach sand deposits are important for recreation by residents and tourists and serve as a barrier against storm waves, thus protecting coastal residences and commercial investments. Sand is also important as a raw material for cement, but chronic removal of sand for construction and other purposes can accelerate beach erosion and degrade or destroy coastal vegetation by uprooting it or flooding the ground with seawater. 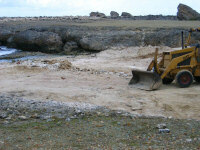 In severe cases, saline ponds are formed in unsightly pits left by mining operations, shoreline trees and other stabilizing vegetation are lost to the sea, and entire beach habitats are eliminated. Moreover, the use of beach sand in construction provides inferior results, including corrosion of steel support elements and electrical components; therefore, the benefits of using high quality, legal aggregate include better construction with less impact on fragile coastal resources. 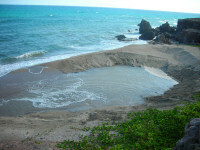 Beach sand removal has reached crisis proportions in many areas of the Caribbean. Islands, in particular, are replete with examples of sand mining operations that have reduced previously sandy beaches to rocky shorelines or foul-smelling saline pits and eliminated once active nesting assemblages of sea turtles. Loss of sandy beaches not only reduces the reproductive success of sea turtles and endangers beachfront property, but it has serious economic implications for vital sectors such as fishing and coast based tourism. 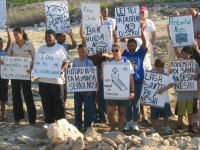 Beach sand mining should be prohibited by law. Because such mining removes sand from the coastal system as a whole and may ultimately affect beach properties distant from the mining, lobbying for holistic regulations and enforcement is important. 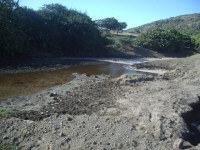 Specific sites, preferably inland deposits, should be designated for sand mining – extraction fees should be implemented and permit conditions enforced.